Of twentieth century British composers Vaughan Williams has had a 'life in pictures', and Elgar too, so this oblong, coffee-table shaped book generously packed with five hundred archival pictures and a deal of text is a most welcome contribution to Walton�s centenary celebrations, which were pin-pointed for February and March. Many of the pictures appear for the first time and the book�s journey travels from Edwardian Oldham via student years at Oxford, wartime and post-war London to his final thirty-year domicile on the island of Ischia where he died in 1983 at the age of 81. His music was both immensely popular and immediately accessible (particularly the film scores for the Olivier films of Shakespeare�s history plays Henry V and Richard III, as well as Façade to Edith Sitwell�s bizarre poems) as well as turbulent and troublesome. Not everything was a success (the operas for example) though time will tell if another assessment awaits at another time. 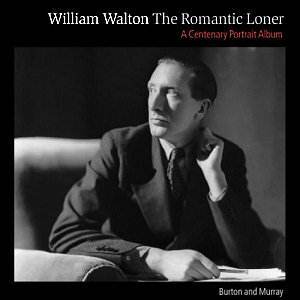 Walton was an enigmatic character, mixing with the smart sets of his age and in artistic circles which included Siegfried Sassoon, the Sitwells (�a rum lot�), Courtaulds (valued patrons), Lady Alice Wimborne, Frederick Ashton, Olivier, Berg, Hindemith, Menuhin and Previn. As the last named points out in his Foreword, there are few composers of the last century whose music is instantly recognisable. He puts Walton among the few, though of the great Britons I would say that Elgar, VW, Walton, Britten and Tippett are all pretty easy to identify, one from the other and with those from other countries; maybe it is a peculiarly British trait that our country�s composers carry their musical identity cards so obviously and so publicly. Walton�s creative processes tended to adhere to classical structures (symphonies, operas, overtures, sonatas, concertos and oratorios). He produced sublime melodic outlines many of them featuring wide intervals to give a feeling of aching yearning, his more energetic moments fizzed with energy and vitality (Portsmouth Point, Spitfire Prelude and Fugue, the scherzo of the first Symphony for example, while the jagged, angular outlines of the symphony�s first movement and its apotheosis in the last, the drama of Belshazzar�s Feast, and the sheer fun of Façade all demonstrate the diversity of his music. This picture-led tracing of his life is a wonderful record not only of Walton and his music but also of the times in which he lived. Humphrey Burton�s pedigree needs no introduction, his work in television and the arts is legendary. His co-author Maureen Murray also worked in film and was a Production Secretary to Tony Palmer (Director of the Walton film biography, At the Haunted End of the Day) when she met Walton and his wife. Eventually, in 1990, Murray, with Lady Susana Walton�s agreement, organised all the Walton memorabilia on Ischia into an archive, which forms the basis of this book. All the eight chapters (each covering anything from eight to sixteen years) begin with an introductory text followed by photographs illustrating the same years, and the book concludes with selected compositions and bibliography (for a completely comprehensive list you would have to refer to Stewart Craggs� excellent compilation, William Walton: A catalogue, 2nd edition (Clarendon Press, 1990). Walton was an unashamed sponger in the 1920s, and grateful to the �bright young things� who supported him, particularly the Sitwells and then, through Christabel McLaren (Lady Aberconway), Mrs Elizabeth Courtauld�s generous annual legacy of �500 (five times his current annual income from royalties at the time). After the early (1922) success of Façade, which brought immediate fame, the viola concerto heralded a change in style �more melodious and mature� to quote Walton himself. Its dedicatee Tertis declined the first performance, a 1929 Prom, and it was Hindemith who came to the rescue to serve the composer up with another public triumph, after which Tertis ate humble pie and went on to give authoritative performances of the work. Two years later Belshazzar�s Feast was premiered at the 1931 Leeds Festival under Sargent, a work which Cardus assessed beautifully as �a clear case of red-hot conception instinctively finding the right and equally red-hot means of expression�. Beecham, on the other hand, got it entirely wrong when he suggested to Walton, �Why not throw in a couple of brass bands? No one will ever hear the piece again�. Harty commissioned the first Symphony early in 1932 initially for the Hallé Orchestra but then for the LSO when he moved on. In 1934 Harty, frustrated by Walton�s unending delay in finishing the work (due largely writer�s block brought on by his turbulent relationship with Baroness Imma von Doernberg), performed it incomplete (with no finale). The new woman in his life (Alice Wimborne, 22 years his senior but another Baroness) inspired him to complete it the following year, but Walton�s liaison was disapproved of by Osbert Sitwell for many years, and because the composer was no longer welcome at Carlyle Square, he bought a small house in South Eaton Place in Belgravia. Walton�s career flourished in the 1930s with film music, collaborations in ballet with the choreographer Frederick Ashton, the 1937 coronation (Crown Imperial), and the wonderful Violin Concerto for Heifetz in 1939. Between this work and the second string quartet of 1947 Walton composed comparatively little and few works of significance or substance. His house was destroyed in the same air raid that flattened the Queen�s Hall in May 1941 and he was living with the now widowed Lady Wimborne. Nevertheless his film music flourished though it was much linked with the war and keeping up morale on the home front. After 1945 he had a different threat to contend with, Britten, eleven years his junior and instantly famous with his opera Peter Grimes (labelled �Grimy Pete� by the envious Walton). In 1947 he in turn was ready to write an opera, Troilus and Cressida, though he was forced to suspend work due to the mortal illness of Alice Wimborne. She died in 1948 and in September that year Walton was a member of a Performing Rights Society delegation to Buenos Aires seeking to persuade the Argentinians to sign the Berne copyright convention. There he met and married Susana Gil Passo, the British Council�s social secretary there and 24 years his junior. Surprisingly he turned his back on London and took his young bride to the island of Ischia in the Bay of Naples, setting up home, first in an abandoned convent and then in a disused wine store for the last 33 years of his life. He resumed work on the opera for Covent Garden, eventually taking five years to complete it (two hours of music), and constantly prey to uncertainty and self-doubt. Circumstances were doggedly against him, 238 errors in the band parts at the first rehearsal, all his preferred singers, director and designer would or could not take part (Schwarzkopf, Gedda, Olivier, Henry Moore) while it proved too much for the ill-prepared Sargent. Still enough was discernibly good for it to travel to America and to La Scala, Milan. The melancholy cello concerto was written for Piatigorsky in 1957, a work Walton considered to be the best of the three concertos he wrote (all for string instruments). The second symphony had an equally difficult gestation period as the first and once again missed the final delivery date, to be given at the Edinburgh Festival in 1960 with mixed success, though much improved under Georg Szell in Cleveland the following year. A final move took place on Ischia to the house known as San Felice in 1962. He fought cancer, was awarded the Order of Merit, having been knighted years before in 1951, and lived out his last years as a grand old man of English music, even though composition was becoming a painful process, much of it limited to ceremonial fanfares and short choral works to religious texts (sketches for a third symphony remained incomplete). He is commemorated in Westminster Abbey in the musicians� corner, his ashes lie buried at La Mortella, his Ischia home, under a rock known as William�s Rock. This book is a worthy tribute to the man, honest in its assessment, graphic in detail and copiously illustrated throughout, in short a perfect introduction to the man and his music.